Update: After a long legal battle, the River Place Nature Trail survived closure a few years back. Now the trail may effectively be closed to non-residents with a fee plan going forward in the near future. 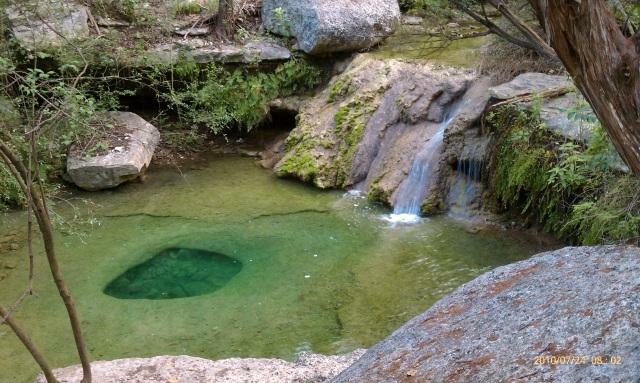 See the timeline of events documenting the travails of one of Austin's best trails. 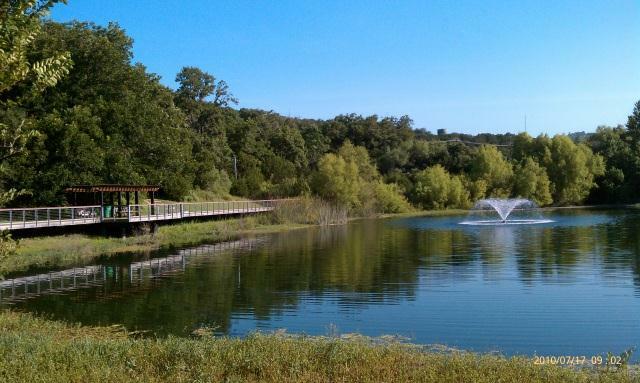 The southern trailhead features a boardwalk along the edge of a nice pond. 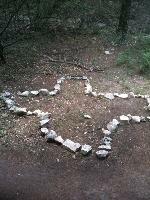 Hiked just about every trail in the Austin area and looking for something new or challenging? The River Place Nature Trail just might be the trail you've been looking for. Much of the trail follows along stream beds through the canyon. This new trail was created by the Municipal Utility District that serves the River Place neighborhood. In a word, the trail is fantastic. There are some steep elevation gains and descents that are mitigated somewhat by the ubiquitous placement of steps and stairs. One of three trailheads are located on Big View Drive across the street from the tennis courts and small soccer fields. The trailhead here includes a nice kiosk detailing the trail map and animals that one might find along the trail. The first section of the trail is a boardwalk that follows the boundary of a retention pond. You'll find lots of turtles here and sometimes folks that are fishing. The trail soon turns rough and disappears into the brush uphill. A few spots here and there feature nice waterfalls and interesting formations like this depression in the stream bed. This first section of trail is referred to as Lower Panther Trail, named after the surrounding area, Panther Hollow. How did this name come about? When the area was still a working ranch several dead goats kept turning up near cave entrances. Ranch hands tracked down a Mountain Lion in this area thought to be responsible for the kills and dispatched it. There have been no Mountain Lion sightings in the area for quite some time. The trail surface is hard pack and rock. 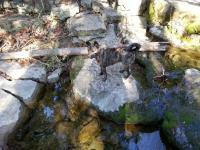 It's uneven and often hugs the side of steep slopes above Panther Hollow creek. The trail builders used a lot of logs to buttress the downhill side of the trail for stabilization. It obviously required a lot of work to put this trail into place. About a half mile into the hike there's a junction point that leads into two possible directions. To the right is the trail segment marked as Little Fern Trail. It leads to one of two trailheads along River Place Blvd. 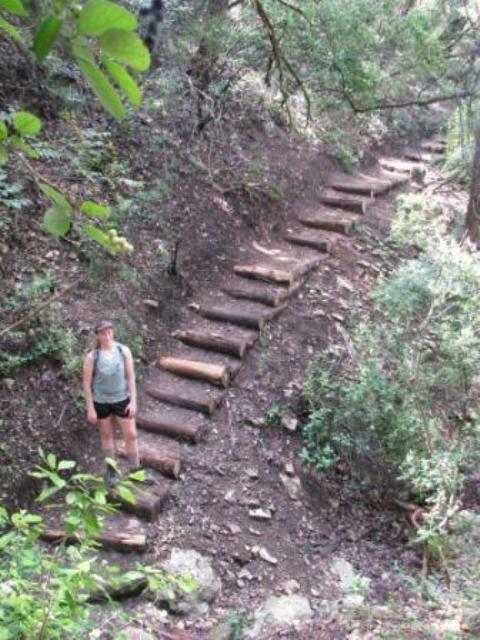 Did we mention that there are lots of stairs on this trail? If one takes the Little Fern Trail option, there's is yet another another trail segment option. The Water Line Trail parallels Lower Panther Trail on the opposite side of the creek. Unlike the rest of the trail system, this segment is relatively flat and wide open to the sky. It's really more of a utility service path, but it's an option none the less. The main option continues north and encompasses the newest addition to the trail system which includes trail segments entitled Upper Panther Trail and Canyon Trail. Here you'll find the roughest terrain with the biggest elevation variation. 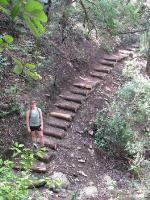 Expect quite a stairmaster-like workout as you descend into and ascend out of creek beds and ravines. The northern portions of the trail feature a couple of vistas, otherwise your path is well sheltered by trees and brush. The northern sections of trail also feature a few vista views of the surrounding canyon lands and the River Place golf club below. According to the official maps there are a couple of emergency exits onto the golf course along the northern trail segment. The northern trail segment also empties out onto River Place Blvd. Although the River Place Blvd. trailheads lack explicit parking, there is space along the road to park. In looking at the satellite views of the area it's quite possible that the trail system here could be expanded a bit further, though I have seen no plans put forward to do this. Whether the mileage gets increased or not, this trail is worth the visit. 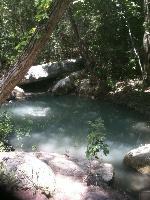 For my 60th burthday my daughter and I hiked this trail. Lots of steps and people (it's very popular). Not for those that want to start going up and keep going up, the 400ft net gain requires 620ft of total gain. 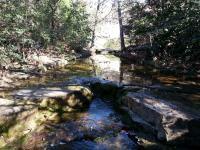 A rigorous hike through mostly wooded areas with occasional openings that overlook the city neighborhoods. It was a fun way to start the day. This was our second time hiking this trail. 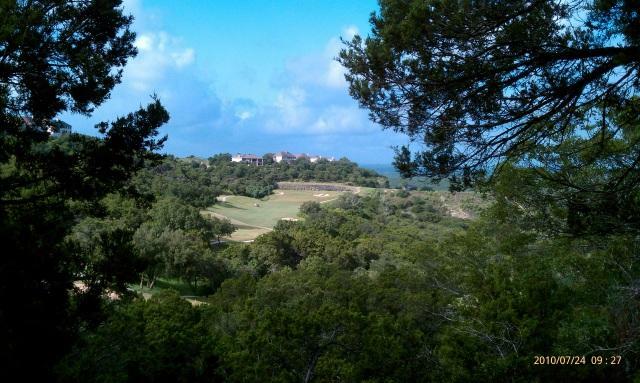 It's very well maintained and has some great scenery. Lots of cliffs here and there along with tiny waterfalls. It would be great to come here after a rain. There a A LOT of stairs here, so be prepared. Also, don't hike on the Water Main Trail. It's just a maintenance road for some water mains and smells like sewage. My wife's Fitbit measured that we conquered 96 flights of stairs hiking this trail. It was so worth it. Only thing is I wish is was a little bit longer. They did such a great job making is place. So many beautiful views and the trail is pretty challenging. Not the best place to go for solitude so expect to see lots of other people. My first hike in 10yrs, why I gave it a 5 for difficulty. Moved here 10yrs ago and haven't hiked since leavng Tuscon, Az. Great Christmas day hike, quite a few people out enjoying it. The only spoiler, people not cleaning up after their dogs !! 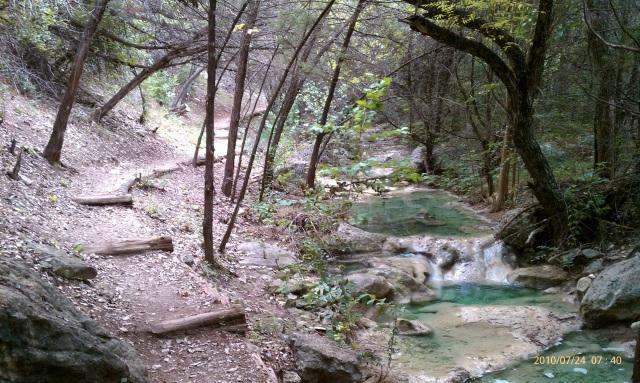 Look forward to going back again to this one and discovering more trails in and around Austin. Great workout with beautiful surroundings! This is a beautiful place and a great workout. I'll be returning to hike it again! I began my hike at the Boardwalk trail head just before sunrise. I made my way up to the very top of the trail (taking a small journey off of the main trail to check out what looked like a side trail but ultimately that went nowhere special) and turned around at the upper trail head on River Place Blvd and made my way back down. 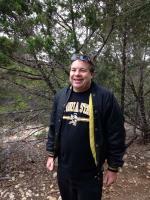 On the way back, I turned and hiked the Little Fern Trail segment. I'm glad I did: That segment has some of the best-looking water features. When I got to the trail head for that segment I turned around and went back and hiked out the way I came in. This was a good workout! BRING WATER! I'm glad I brought more than I thought I would need because I drank it all. There are many, many stairs and I certainly felt it a day and a half after the hike. This trail isn't a loop, so you'll have to turn around and hike it again to get back to where you started, or have someone come and pick you up at your ending spot. I recommend doing what I did if you don't have someone to pick you up: Start at the bottom, go to the top, come back down to the bottom. That way your return trip to your car is mostly descending stairs. The trail was pretty wet and muddy even though it hadn't heavily rained (to my knowledge) before I went. Keep this in mind along with the fact that you have to cross a creek several times and wear appropriate shoes (ones that you don't mind getting covered with mud). For the first hour or so of my hike I didn't see but two other people. After that the place started getting more busy with people and their dogs, so if you want to hike for solitude this isn't the place (I didn't mind, though).